Ruth Daniels' original ink and watercolors are a unique combination of flora and fauna found in tropical gardens. 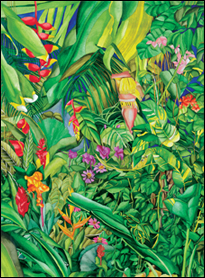 The artist has filled her paintings with details of brightly colored flowers, plants and animals that cohabitate in a rainforest paradise. The images reflect the sunlight and warmth of the Caribbean. Amid the mysteries of the landscape are a mélange of natural forms that are combined with the energy of the sun. An occasional person may appear to reflect, meditate, peer or interact with natural forms. The plush imagery symbolizes the poetry of nature transposed into tangible and often recognizable shapes configured from the unique perspective of the artist immersed in the landscape. Ruth’s work is a welcome addition to any environment seeking to create a sense of warmth, intrigue and comfort. The viewer is immediately drawn into the complexity of the images and can travel, if only for a moment to a tropical paradise. Her work may be purchased as originals or giclee prints. It also may be licensed for the exclusive right to reproduce limited quantities for specific purposes. Please also see Ruth's Hidden Hills Page. Written permission is required for any reproduction of Ruth Daniels' art. All work is protected by Copyright ©.